HOW DO I KILL ALL TYPES OF INFECTIONS FOUND IN LYME DISEASE? For many people, chronic Lyme disease is a soup of infections, each germ type requiring a different set of germ killers. These infections include: Borrelia (Lyme), Bartonella, Babesia, Anaplasma, Ehrlichia, Candida (Yeast), Parasites, and Viruses. 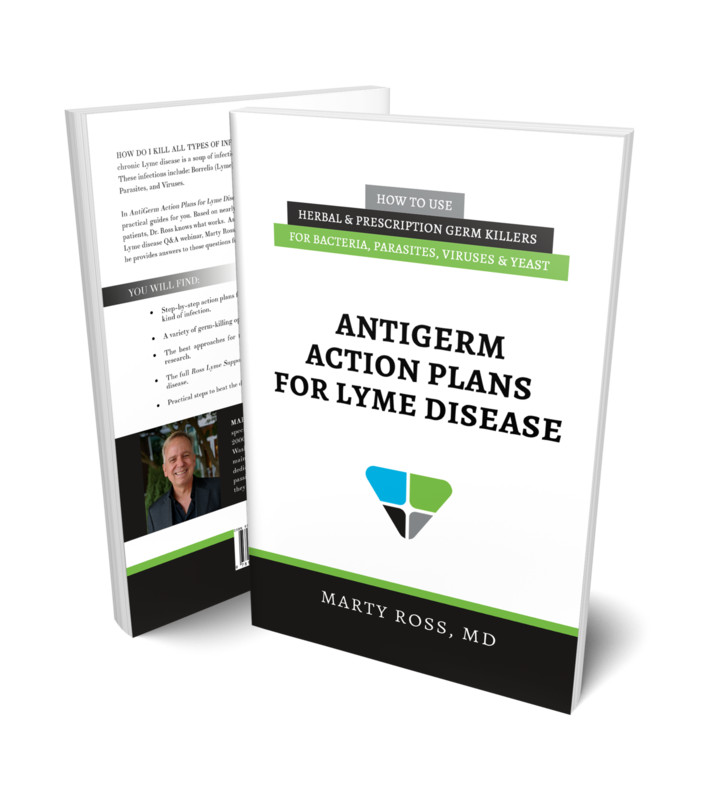 In Antigerm Action Plans for Lyme Disease renowned expert Marty Ross, MD provides step-by-step practical guides for you. Based on nearly 20 years of experience treating thousands of Lyme disease patients, Dr. Ross knows what works. As the host of Conversations with Marty Ross MD, a free weekly Lyme disease Q&A webinar, Marty Ross, MD knows the questions people ask. In this new handbook, he provides answers to those questions full of real solutions. Step-by-step action plans for the best herbal and prescription germ killers for each kind of infection. A variety of germ killing options for each kind of infection. The best approaches for treating bacterial Lyme persisters based on the latest research. The full Ross Lyme Support Protocol for dealing with all aspects of chronic Lyme disease. Practical steps to beat the dreaded Herxheimer reaction. How to Treat Persister Lyme. What Works? antivirals for chronic infections like mono and human herpesvirus type 6. Lyme disease is an illness involving many kinds of infections. For some, killing the Lyme germ infection, Borrelia, is enough. For others, the ticks that infect people with Lyme can also carry and transmit other infections, called the Lyme disease coinfections. These are Bartonella, Anaplasma, Ehrlichia, and Babesia. Additionally, for some, chronic parasite and viral infections living inside of them become active during Lyme and must be treated. On the one hand, killing infections is helpful. However, antibiotics may cause overgrowth of some germs. Using prescription antibiotics to treat Lyme disease may cause too many yeast to grow in the intestines, thereby becoming part of the problem. Antibiotics may also lead to the growth of an intestinal bacterium called Clostridium difficile. To find more information about how to diagnose all these infections, I refer the reader to Treat Lyme (treatlyme.net). The focus of this book is on killing these germs, not diagnosing them. This book is full of action plans to kill these germs. However, Lyme disease is also an illness which causes direct and indirect dysfunction in most of the body’s systems and organs. While I have many ideas about how to address these problems, such as sleep, poor thinking, low energy, hormonal dysfunction, diarrhea, immune dysfunction, and so many more problems, this book is not about addressing those problems. Future books I write will include action plans to deal with these and many more problems occurring in Lyme disease. For now, the reader can read all about how to address most Lyme disease problems online at Treat Lyme (treatlyme.net). For the most part, this book is a compilation of infection treatment plans I have written for Treat Lyme. So, most of this content is available online at Treat Lyme. But I have chosen to publish it as a book because 80 percent of people still prefer to read books instead of reading information online. By publishing this information as a book, I hope to help many more people recover from Lyme. This book is for the person suffering with Lyme. It provides real information you can use to recover. While it is written for people suffering from Lyme disease, this book is also for physicians, nurse practitioners, and physician assistants on the front line fighting this Lyme epidemic. The action plans in this book are ones I have used in my clinical practice treating Lyme disease at The Healing Arts Partnership in Seattle, Washington, since 2004. My approaches are based on science, as well as on my practical experience about what works clinically. You will notice I have provided some references for each of my action plans. In providing references, I try to show some of the foundation behind my ideas. My references are limited though because this book is a hands-on resource based on what I have found to work clinically. In addition to the germ-specific action plans, I also have articles about a limited number of germ killers like dapsone and Biocidin. I include them because there are a limited number of resources that describe these germ killers. In the Appendices section, you will find two bonus chapters. One is The Ross Lyme Support Protocol and the other is Herxheimer Die-Off Reactions: Inflammation Run Amok. I include these essential resources to help you deal with all aspects of treating this illness. Throughout the book, I refer the reader to more information found as chapters here or as articles at Treat Lyme. For references in this book, I will include the chapter after the title [such as “Kills Yeast: A Brief Guide. (Chapter 2)”]. Information found at Treat Lyme will include the reference (treatlyme.net) after the article name [such as “Lyme Disease Pain Treatment (treatlyme.net)”]. Throughout this book, I include dosing information. These recommendations include the strength and dosing frequency. In general, the strength is for an average adult of about 150 to 175 pounds. For children’s dosing of natural medicines, in my practice, I use a proportion of the adult dose based on weight to determine the strength of the natural medicine. For instance, a 50-pound child usually receives one third of the suggested adult strength. The dosing frequency for children and adults are the same. For prescription medicines and children, I follow standard strength recommendations approved by the United States Food and Drug Administration in the prescription package insert. I refer the reader to the label of the prescription or natural medication for information about whether to take it with or without food. All supplements are not created equal. Some manufacturers include substances not found on the product label or do not include the active ingredients listed. In 2015, the New York State Attorney General studied supplements at Target, Walmart, GNC, and Walgreens. The study found the active ingredients listed on the label in the products only 21 percent of the time by DNA testing. In addition, 35 percent of the ingredients by DNA testing were not listed on the labels. A previous study by Newmaster published in 2013 showed similar findings. The good news is there are many high-quality supplement manufacturers that do not have the problems I discuss above. You can find the manufacturers and products I recommend, based on my extensive experience and detailed review, at Marty Ross MD Supplements (treatlyme.com). 1. A.G. Schneiderman Asks Major Retailers To Halt Sales Of Certain Herbal Supplements As DNA Tests Fail To Detect Plant Materials Listed On Majority Of Products Tested. February 2015. https://ag.ny.gov/press-release/ag-schneiderman-asks-major-retailers-halt-sales-certain-herbal-supplements-dna-tests. Accessed October 4, 2018. 2. Newmaster SG, Grguric M, Shanmughanandhan D, Ramalingam S, Ragupathy S. DNA barcoding detects contamination and substitution in North American herbal products. BMC Medicine. 2013;11:222. doi:10.1186/1741-7015-11-222. 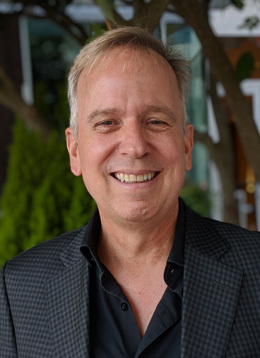 MARTY ROSS, MD is an integrative medicine MD specializing in the treatment of chronic Lyme disease. In 2000 he founded The Healing Arts Partnership in Seattle, Washington where he provided care to thousands. He maintains an online site called Treat Lyme dedicated to teaching and helping Lyme sufferers. He is passionate about giving people the information and tools they need to recover.